TORONTO – It’s not often that Toronto FC enters a match as the underdog, a situation it found itself in on Tuesday night. The Reds are the undisputed kings of Major League Soccer, but Tigres is one of the best teams in Mexico and the CONCACAF region, having won a sixth Mexican Liga MX title last season. 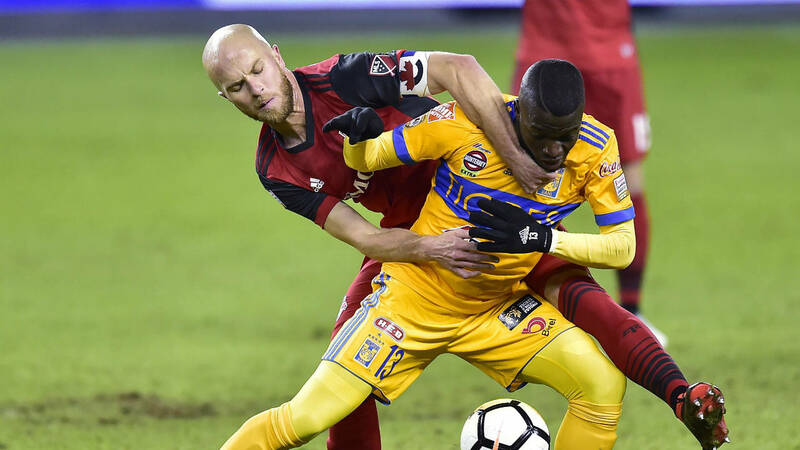 Tigres’ big reputation meant little to TFC, though, as the MLS Cup champs earned a dramatic 2-1 win over Tigres in the first leg of their CONCACAF Champions League quarter-final. Canadian Jonathan Osorio was the hero, scoring the winning goal in the 89th minute to send the crowd of 25,587 fans at BMO Field into a state of frenzy. The second leg of this quarter-final is scheduled for March 13 in Monterrey. TFC moves on with a win or a draw. Tigres can advance to the next round with a 1-0 win. “We’re confident. The objective was to leave here with a lead. …. They have a [road] goal, but we have the lead, and that’s the advantage. We’re excited. We’re excited to go there and protect our lead,” Osorio told reporters after the game. Osorio’s deft, back-heeled goal with the inside of his left foot was shades of Alessandro Del Piero’s iconic goal for Juventus against Borussia Dortmund in the 1997 UEFA Champions League final. It took a lot of confidence and cheek to pull off a play like that in such a high-stakes match against an opponent the calibre of the Liga MX champions. Osorio called Tigres “one of the best clubs on the continent.” However, their stature in the North American game didn’t make the MLS Cup champs cower in fear. “[TFC] is not a club to get intimidated anymore by anybody. We’ve proven that the last few years. We’re trying to make a reputation here of being the best, and whatever game we go into, we try to win. In order to do that, we have to go into these games with no fear,” Osorio stated. Osorio deservedly earned man-of-the-match honours, but there were other standout performances by TFC players on the night. Captain Michael Bradley was a workhorse in running himself ragged from box to box, Jozy Altidore effectively held up the ball up front, and Mark Delgado, like Osorio, provided a creative spark in midfield with his probing runs and sublime passing. Toronto coach Greg Vanney deployed a 3-5-2 formation, with Osorio and Delgado starting alongside Bradley in central midfield, and Justin Morrow and Gregory van der Wiel out wide. Victor Vazquez and fellow Spaniard Ager Aketxe were on the bench. Tigres (or, to use its full name, Club de Fútbol Tigres de la Universidad Autónoma de Nuevo León) started with influential French goal-scorer Andre-Pierre Gignac on the bench. Former West Ham United forward Enner Valencia and Chilean international Eduardo Vargas led the attack up front. The first half was an even affair between the two sides, although TFC did commit far too many cheap giveaways early on. The visitors were well disciplined and organized when not in possession, as midfielders Jesus Duenas and Javier Aquino lent valuable support to the defence. While Tigres dominated possession through the opening 45 minutes, Toronto carved out the better chances, Morrow came close to scoring in the eighth minute, and Tigres goalkeeper Nahuel Guzman made a crucial kick save on Sebastian Giovinco after a flick from Altidore played the Italian in on goal. Gignac replaced Valencia at the start of the second half, but it was Vargas who broke the deadlock with an exquisite finish. The Chilean latched on to a headed pass that Toronto defender Chris Mavinga was too slow to deal with, and fired a shot across the goalmouth into the far corner past goalkeeper Alex Bono. Osorio nearly levelled the score moments later, but the Canadian skied his shot over the crossbar from in close. After that reprieve, Tigres was put to the sword by Altidore, who beat Guzman from inside the box after receiving a superb, one-touch pass from Delgado that pried open the defence. The final half hour was a furious affair, as the Reds pressed for the winning goal. They were rewarded for their persistence in the final minute of regulation, as Osorio expertly flicked a pass from Giovinco towards the net that handicapped Guzman and trickled over the goal-line. Mavinga made up for his previous flub when he made a goal-saving tackle in injury time to deny Gignac. “We had good pressure. [Michael Bradley] sent a good ball out to Seba, and I saw an open space [in the middle of the box]. I think they were looking for a foul or something, and they didn’t drop back. I found myself alone, the ball came across and it was a little behind me, so it was just instinct to [back-heel] it,” Osorio said of his winning goal. NOTES: Either Toronto FC or Tigres will meet the winner of Club America (Mexico) versus Tauro (Panama) in the Champions League semifinals. Club America leads 4-0 after the first leg of that series… TFC has a bye this week in MLS, and then it’ll travel to Montreal to take on the Impact on March 17 in Week 3. Back-to-back home games against Real Salt Lake and D.C. United follow Toronto’s trip to Montreal.